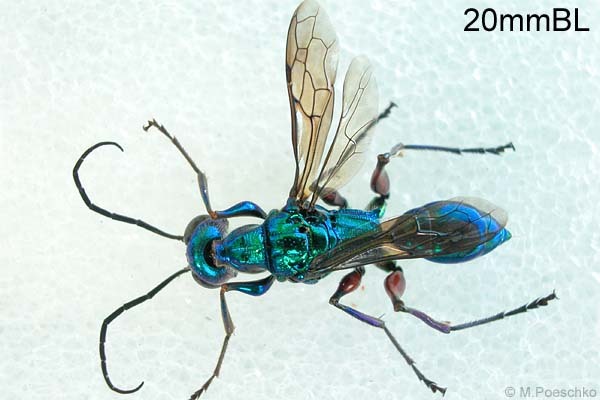 KEY FEATURES: Iridescent blue-green wasp to 20mmBL. WINGS fold flat on body, smoky with black veins. THORAX 50% of BL, rectangular with tapering front. ABDOMEN wide-ovoid with slender and short attachment. LEGS frontpair blue-green; two hindpairs with orange thighs, rest blue-green. 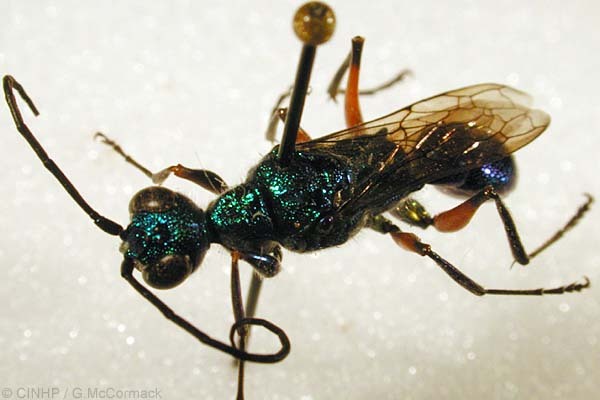 SIMILAR SPECIES: See under Cuckoo Wasp (Chrysis). TAXONOMY: ANIMALIA; ARTHROPODA; ATELOCERATA; HEXAPODA; INSECTA; PTERYGOTA; Hymenoptera; Apocrita; Aculeata; Apoidea; SPHECIDAE. COMMENT: Sometimes in Family AMPUCILIDAE. Rarotonga: specimen+photo, 5/2005, M.Poeschko, ID G.McCormack as Ampulex compressa 5/2005 based on BPBM specimen image. Special Reference: W&D79: Walker, Annette K. and Deitz, Lewis L. (1979) A review of entomophagous insects in the Cook Islands. New Zealand Entomologist 7(1):70-82; Kuhlmann, M. (2006) Fauna and Biogeography of the Bees and Wasps of the Cook Islands (Hymenoptera Aculeata), J. Hym. Res. 15(1):26-37.